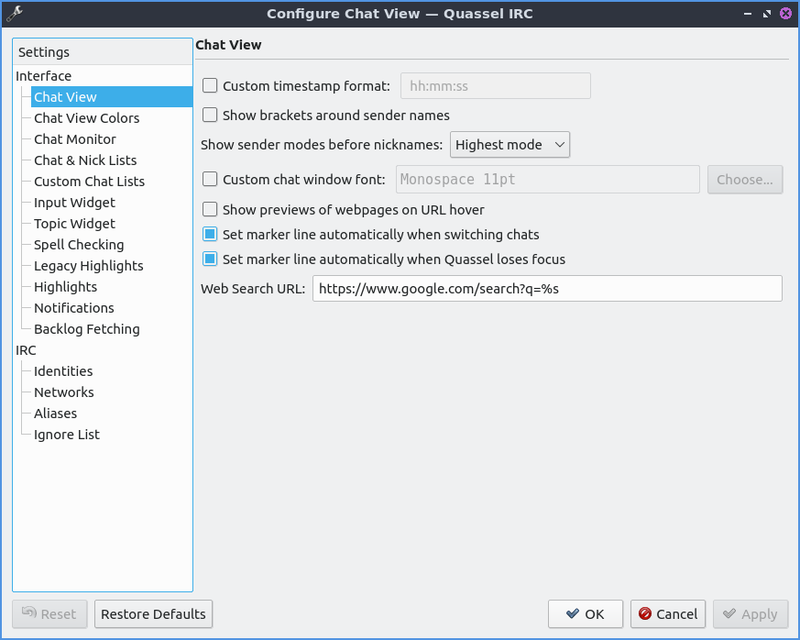 Quassel IRC is a modern, cross-platform, distributed chat client. Quassel aim to bring a pleasurable, comfortable chatting experience to all major platforms (including Linux®, Windows®, and MacOS X® as well as Android smartphones), making communication with your peers not only convenient, but also ubiquitous available. To chat on IRC you need to connect to a server and join a channel. This can be done with the join button or by typing “/join [channel]”. To send a query or private message directly to someone type “/query” username or right click on the user list and select start query. If you wish to view older messages just scroll up. Scroll down to view newer messages. To add the Lubuntu IRC chat network click File ‣ Networks ‣ Configure_Networks +Add(Networks) -> Use preset, select Lubuntu IRC -> click OK. To join a channel simple type “/join 1” (where 1 is the channel name), right click the network and select join channel or use the join button. In Quasel if someone says your name you are said to be highlighted which in Quasel will make a sound and in a goldenrod color over the line of text with your name on it. The notification will also be shown on your desktop if you are in another window. To use Sasl authentication to autologin to an account no matter which nickname you want to use File ‣ Networks ‣ Configure networks to bring up a network configuration dialog. Click on the autoidentify tab and press the checkbox for use SASL authentication. Enter your username on the IRC network in the username text field. Input your password into the password field so that you know how to auto identify. You can also autoidentify without using sasl by clicking the Top checkbox. Nickserv is a sensible default for what the services is but it may be different on different servers and put your password in where you autoidentify. To ignore a really annoying user you can on the nicks bar on the right hand side right click ignore and then select a user to ignore so you will not see what they type. If you realize you want to talk to them again Right click the same username and uncheck the checkbox for the ignore rule you created. You also can switch between multiple channels with Alt + up arrow to move up or Alt + Down arrow to move down. To go to the next active chat press Alt + Right or to go to the previous active chat Alt + Left. To jump to a hot chat press Meta +A. To type a message to an entire channel type into the bar at the bottom and press enter. To complete typing someone’s nickname press the Tab key to complete their name. To paste text into the channel such as a link press Control + V or right click paste. If you see a hyperlink in chat you can left click on the link to open in your webbrowser. Another is if you want to copy the link right click on it and copy link address. If you want to have settings for automatic reconnecting File ‣ Network ‣ Configure network and select the Connection tab. The checkbox for auto reconnect will automatically rejoin chats if you get disconnected. The wait filed shows how long to between the retries between each try. The checkbox for rejoin all channels after reconnecting lets you rejoin all of your channels without having to manual rejoin each. The number of retries is how many times to retry to connect before stopping. To have an unlimited number of retries click the unlimited number of checkboxes. To add close the list of nicknames or channels press the X button. To reopen the view of nicks View ‣ Nicks. To close the list of all chats press the X button to close a list of all channel and private messages you are in. To reopen it press the View ‣ Chat lists ‣ All chats. To make your chat full screen View ‣ Full Screen Mode or Control + Shift +F. To change your settings on your notifications Settings ‣ Notificiations. To select which event to change your settings left click on Private message when focused, Highlight, Highlight When Focused, or Private Message. If you do not know what highlight is it is when someone mentions your name in a channel. The checkbox Play a Sound allows you to to toggle playing a sound in the context. The checkbox Show message in a popup creates a popup notification when someone else mentions you. The Log to file puts the message in a file. The Mark taskbar entry makes the taskbar entry appear highlighted. 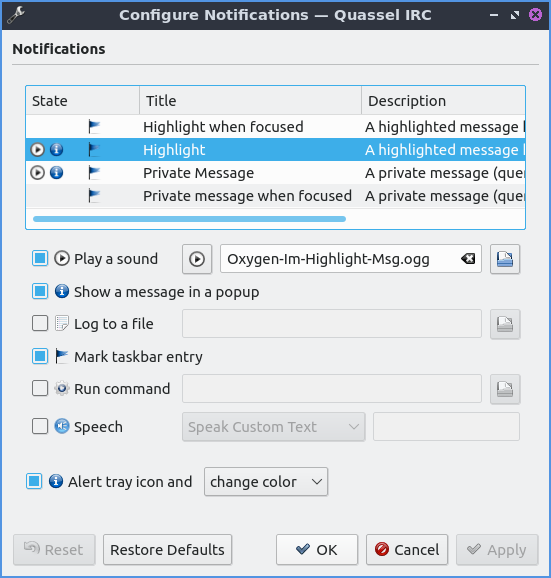 To select all of your Settings for Quassel Settings ‣ Configure Quassel. To see all the nicknames of someone in a channel are located in a sidebar labeled Nicks. The lists of all channels you are in is labeled All chats. To switch between different channels left click on the channel name. To change your preferences for quassel press F7 or Settings ‣ Configure Quassel. To change the client style for the widget of quassel choose a widget style from the Client style drop down menu. To toggle showing tray icon check/uncheck the Show system tray icon checkbox. If you want to be able to close the quassel window and still have quassel running in the system tray to bring it back up check the Hide to tray on close button. The Chat view tab has settings for colors timestamps and hyperlinks. To chose a custom chat window font press the Custom chat window font checkbox and then press the choose button to choose a new font. To toggle if you want colored text press/unpress the Allow colored text checkbox. To toggle previews of hyperlinks in chat check/uncheck the Show previews of webpages on URL hover. To toggle setting marker line when switching chats check/uncheck the Set marker line automatically when switching chats. To toggle the set marker line automatically when Quassel losses focus check/uncheck Set marker line automatically when Quassel loses focus checkbox. To change the Colors of your user interface on Quassel check the Custom Colors checkbox. Then there are many buttons for each different kind of message which you can press the buton that all bring up the 1specific color for that kind of message. The Chat & Nick Lists has settings for the lists of nickname lists. The Custom font checkbox lets you chose a custom font on the lists of nicks and the Choose button lets you choose the font you want. The Display topic in tooltip shows the channel topic in a tooltip if you move the mouse over it. If you want to be able to switch channels from the mouse wheel check the Mouse wheel changes selected chat checkbox. The checkbox Use Custom Colors enables the settings for different colors for the different channels. The buttons next to Standard, Inactive, Highlight, or Other activity all change what color the channel appears when you are in a list of channels. The Custom Nick List colors checkbox lets you change the color of nicks in the list. The Online button changes the color of nicks of online users. The Away button changes the color of nicks of Away users. The Input widget has settings for what you tab to type into chanels or private messages. The Custom Font checkbox has a thing to activate your own custom font for just input and press the Choose button to the font. 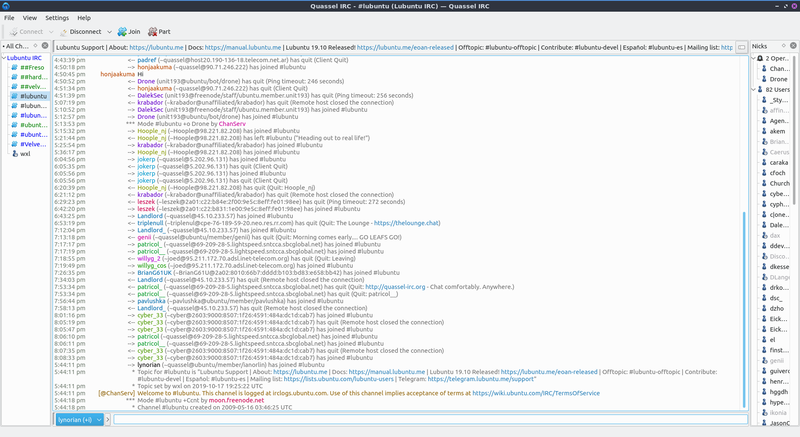 To have per chat history check the Enable per chat History checkbox. The checkbox Show nick selector puts a widget in the lower left corner of the window to select different nicks. The checkbox Show style buttons shows buttons that style your text hidden in an arrow under an arrow. To enable line wrapping when you type a long line in the input box check the Line Wrapping checkbox. 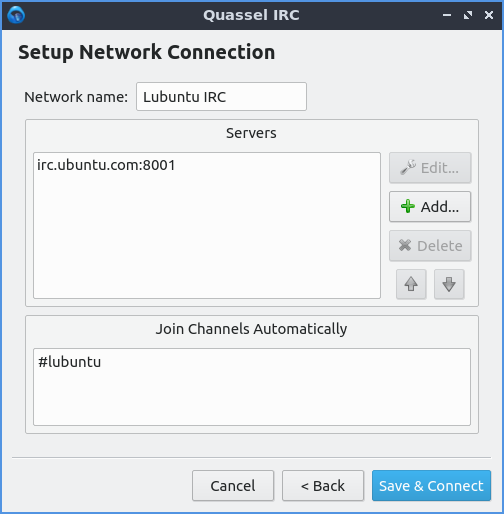 Lubuntu ships with version 1:0.13.1 of Quassel IRC.